I’ve really been enjoying putting freezer meals together more regularly. It is so nice to grab something out of the freezer, get it in the crockpot and not have to think much about dinner again, until it’s about time to eat. I love Teriyaki Chicken so I was excited to give this one I found over at Ring Around the Rosies a try. Add additional 1/4 c teriyaki sauce to crockpot and cook on low for 7 hours. Serve over hot rice. My take on this freezer meal? I thought it was all right. The carrots were weird for me and next time I wouldn’t use them. But I’ll make it again with a little ingredient adjusting! Other than the carrots I thought it was good and had a good flavor. 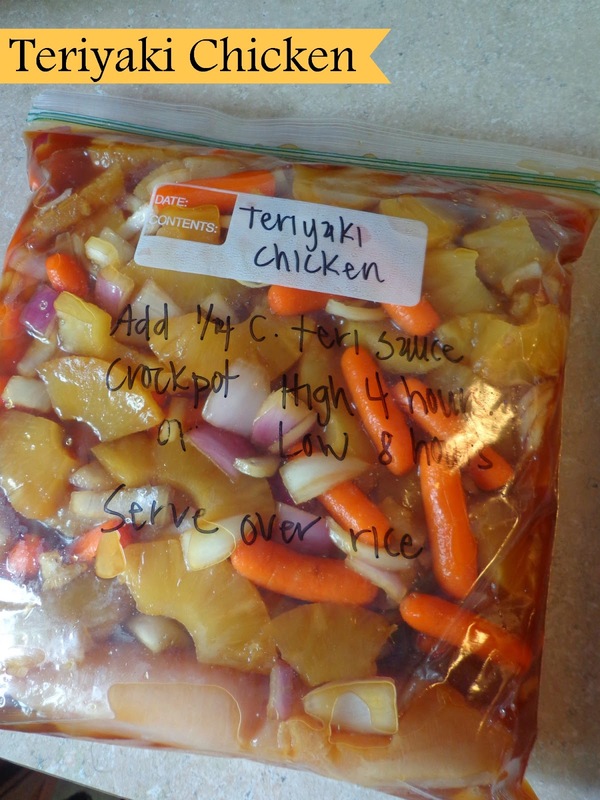 What do you put in your Teriyaki Chicken? Great recipe! I have been looking for more freezer friendly meals that my husband would like, so Im going to have to make this one!